Mother Teresa, in full Saint Teresa of Calcutta, (born Agnesa Gonxha Bojaxhiu August 27, 1910 – September 5, 1997), Bharat Ratna, OM, was born in Skopje, Ottoman Empire (located in modern-day Macedonia). At the age of 18, she left home to become a Roman Catholic nun and join the Sisters of Loreto in Ireland. Mother Teresa founded the Missionaries of Charity in India in 1950. She was forty years old. Her lifetime of service to the poverty-stricken of Kolkata (Calcutta) made her one of the world's most famous people. She was beatified by Pope John Paul II in October 2003. She was canonized by Pope Francis I on September 4, 2016. Her supporters sometimes referred to her as the "Angel of Mercy" and "Saint of the Gutter." She was a woman who experienced God's call in such an intense and personal way that she took a path that gave up the creature comforts most of us covet. In requesting permission to establish the Missionaries of Charity, she was asking to fulfill a calling as a nun but outside the confines of the convent. In so doing, she bucked tradition and lived her life in service to and among the most desperate souls of humanity. Gonxhe, the third child in the Bojaxhiu family, was born in the family home at Pop Kocina street 13, in the center of Skopje on August 26, 1910. She was baptized in the Heart of Jesus Catholic Church. Gonxhe successfully completed elementary and high school in church schools, where she was an active member of the drama section, the literary section, and the church chorus. Over all, she enjoyed a happy childhood with her older brother and sister. The Bojaxhiu family had a long tradition of success in crafts, fabric dyeing and trade. At age 12, Gonxhe joined an Abbey. When Gonxhe was 18, she became a member of the Loreto Order of nuns in Ireland, taking the name, Sister Teresa. Six months later, she was sent to the Loreto Convent in Calcutta. She taught school there and eventually became principal. As her relationship with Jesus strengthened, she felt his pain toward the very poor. She experienced Jesus' call to go and bring God's love and be of service to the most desperately poor of Calcutta. This led her to leave the comparative comfort of the school compound, protected from the city's most abject poverty, and live on the streets with the poorest of the poor. After two years of serving on the streets of Calcutta, in October 1950, Teresa requested and received Vatican permission to start a diocesan congregation, which would become the Missionaries of Charity. The mission was to care for (in Teresa's own words) "the hungry, the naked, the homeless, the crippled, the blind, the lepers, all those people who feel unwanted, unloved, uncared for throughout society, people that have become a burden to the society and are shunned by everyone." It began as a small order with 12 members in Calcutta. By 2006, there were more than 4,000 nuns running orphanages, AIDS hospices, and charity centres worldwide, caring for refugees, the blind, disabled, aged, alcoholics, the poor, homeless, victims of floods, epidemics and famine on all six continents. In 1952, the first home for the dying was opened in space made available by the City of Calcutta. With the help of Indian officials Mother Teresa converted an abandoned Hindu temple into the Kalighat Home for the Dying, a free hospice for the poor. Soon afterwards she opened another hospice, Nirmal Hriday (Pure Heart), a home for lepers called Shanti Nagar (City of Peace), and an orphanage. The order began to attract both recruits and charitable donations. By the 1960s, the order had opened hospices, orphanages and leper houses all over India. Mother Teresa was one of the first to establish homes for AIDS victims. Teresa's order grew rapidly. New facilities opened all over the globe. The order's first house outside India was in Venezuela. Others followed in Rome, Tanzania, and eventually in many countries in Asia, Africa, and Europe, including Albania. By the early 1970s, Mother Teresa had become well known internationally. The 1969, documentary film, Something Beautiful for God filmed by Malcolm Muggeridge and his 1971, book of the same title publicized her work around the world. Film footage for the documentary, taken in poor lighting conditions, was thought by the crew to be unusable. However, after returning from India, the film was found to be extremely well lit. Muggeridge claimed this was a miracle of "divine light" from Mother Teresa. Others in the crew thought it more likely ascribable to a new type of film. Muggeridge later converted to Catholicism. In 1982, Mother Teresa persuaded Israelis and Palestinians, who were in the midst of a skirmish, to cease fire long enough to rescue 37 mentally handicapped patients from a besieged hospital in Beirut. When the walls of Eastern Europe collapsed, she expanded her efforts to communist countries that had rejected her, embarking on dozens of projects. Mother Teresa also traveled to help the hungry in Ethiopia, radiation victims at Chernobyl, and earthquake victims in Armenia. In 1991, Mother Teresa returned for the first time to her native region and opened a Missionaries of Charity Brothers home in Tirana, Albania. By 1996, she was operating 517 missions in more than 100 countries. Over the years, Mother Teresa’s Missionaries of Charity grew from 12 nuns to thousands serving the "poorest of the poor" in 450 centers around the world. The first Missionaries of Charity home in the United States was established in the South Bronx, New York. Analyzing her deeds and achievements, Pope John Paul II asked: "Where did Mother Teresa find the strength to place herself completely at the service of others? She found it in prayer and in the silent contemplation of Jesus Christ, his Holy Face, his Sacred Heart." In his first encyclical Deus Caritas Est, Benedict XVI mentioned Teresa of Calcutta three times. He also used her life to clarify one of his main points of the encyclical. "In the example of Blessed Teresa of Calcutta we have a clear illustration of the fact that time devoted to God in prayer not only does not detract from effective and loving service to our neighbor but is in fact the inexhaustible source of that service." Although there was no direct connection between Mother Teresa's order and the Franciscan orders, she was known as a great admirer of St Francis of Assisi. Accordingly her influence and life show influences of Franciscan spirituality. Her sisters say the peace prayer of St. Francis every morning before breakfast. Many of the vows as well as the emphasis of her ministry are similar. St. Francis emphasized poverty, chastity, obedience and submission to Christ. He also devoted much of his own life to service of the poor in the area where he lived, especially lepers. In 1983, Teresa suffered a heart attack in Rome, while visiting Pope John Paul II. After a second attack in 1989, she received a pacemaker. In 1991, after a battle with pneumonia while in Mexico, she had further heart problems. She offered to resign her position as head of the order. A secret ballot vote was carried out. All the nuns except her, voted for Mother Teresa to stay. Mother Teresa agreed to continue her work as head of the Missionaries of Charity. In April 1996, Mother Teresa fell and broke her collar bone. In August, she suffered from malaria, and failure of the left heart ventricle. She underwent heart surgery, but it was clear that her health was declining. On March 13, 1997, Mother Teresa stepped down as head of Missionaries of Charity. She died on September 5, 1997, just 9 days after her 87th birthday. The Archbishop of Calcutta, Henry Sebastian D'Souza, ordered a priest to perform an exorcism on Mother Teresa shortly before she died because he thought she was being attacked by a devil. She agreed to the exorcism. At the time of her death, Mother Teresa's Missionaries of Charity had over 4,000 sisters, an associated brotherhood of 300 members, and over 100,000 lay volunteers, operating 610 missions in 123 countries. These included hospices and homes for people with HIV/AIDS, leprosy and tuberculosis, soup kitchens, children's and family counseling programs, orphanages, and schools. Mother Teresa was granted a full state funeral by the Government of India, an honor normally reserved for presidents and prime ministers, in gratitude for her service to the poor of all religions in India. Her death was widely considered a great tragedy within both secular and religious communities. Mother Teresa's work inspired other Catholics to affiliate themselves with her order. The Missionaries of Charity Brothers was founded in 1963. A contemplative branch of the Sisters followed in 1976. Lay Catholics and non-Catholics were enrolled in the Co-Workers of Mother Teresa, the Sick and Suffering Co-Workers, and the Lay Missionaries of Charity. In answer to the requests of many priests, in 1981, Mother Teresa also began the Corpus Christi Movement for Priests. Today over one million workers worldwide volunteer for the Missionaries of Charity. During her lifetime and after her death, Mother Teresa was consistently listed by Gallup's List of Widely Admired People to be the single most widely admired person. In 1999, she was ranked as the "most admired person of the 20th century." Notably, Mother Teresa out-polled all other volunteered answers by a wide margin, and was in first place in all major demographic categories except the very young. The former U.N. Secretary-General Javier Pérez de Cuéllar, said: "She is the United Nations. She is peace in the world." Nawaz Sharif, the Prime Minister of Pakistan said that Mother Teresa was "A rare and unique individual who lived long for higher purposes. Her life-long devotion to the care of the poor, the sick, and the disadvantaged was one of the highest examples of service to our humanity." Following Teresa's death in 1997, the Holy See began the process of beatification, the second step towards possible canonization, or sainthood. This process requires the documentation of a miracle performed by intercession from Mother Teresa. In 2002, the Vatican recognized the miracle of the healing of a tumor in the abdomen of an Indian woman, Monica Besra, following the application of a locket containing Teresa's picture. Monica Besra said that a beam of light emanated from the picture, curing the cancerous tumor. Teresa was formally beatified by Pope John Paul II on October 19, 2003, with the title Blessed Teresa of Calcutta. A second miracle was required for her to proceed to canonization. The issue of the alleged miracle proved controversial in India around the time of Mother Teresa's beatification. According to The Daily Telegraph, Besra's husband initially said that the tumor was cured by her faith in herself. He is quoted as saying: "This miracle is a hoax. It is much ado about nothing. My wife was cured by the doctors." He later changed his mind and told an interviewer: "It was her miracle healing that cured my wife. Our situation was terrible and we didn't know what to do. Now my children are being educated with the help of the nuns and I have been able to buy a small piece of land. Everything has changed for the better." On December 17, 2015 the Vatican confirmed that Pope Francis had recognized a second miracle attributed to her, involving the healing of a Brazilian man with multiple brain tumors. Pope Francis canonized her at a ceremony on September 4, 2016 in St. Peter's Square in Vatican City. Tens of thousands of people gathered for the ceremony, including 15 official government delegations and 1,500 homeless people from across Italy. The ceremony was televised live on the Vatican channel and streamed online; Skopje, Mother Teresa's hometown, announced a week-long celebration of her canonization. In India, a special Mass was celebrated at the Missionaries of Charity in Calcutta. Mother Teresa has garnered criticism for her encouragement of sacramental baptisms performed on the dying (a majority of which were Hindus and Muslims), thus converting them to the Catholic faith. The baptisms were done without regard to the individuals' religion. In a speech at the Scripps Clinic in San Diego, California in January, 1992, she said, "Something very beautiful… not one has died without receiving the special ticket for St. Peter, as we call it. We call baptism 'a ticket for St. Peter.' We ask the person, do you want a blessing by which your sins will be forgiven and you receive God? They have never refused. So 29,000 have died in that one house [in Kalighat] from the time we began in 1952." Hindu critics of Mother Teresa locate her work within the wider context of Christian missionary activities in India, which they oppose. Right wing or nationalistic Hindus are opposed to conversion and several attempts have been made to make this illegal, especially in the State of Orissa. Christians are often represented as agents of Western interests who plan to divide India by creating Christian majorities in the North Western states where independence movements are active. They point to the large sums of money from the West that help finance Christian agencies in India. One critic, Ram Sita Goel, writes, 'the mischief created by Christian missionaries has to be seen to be believed… Mother Teresa is part of this gang, presenting India as a… diseased and corrupt country… and collecting fabulous sums for the machinery machine.' Arun Shourie, writing on how Hindus view Christians at the request of the Indian Catholic Bishops' Conference, argued that the Catholic Church in India spoke with a forked tongue; on the one hand it claims to be committed to inter-religious dialogue while on the other it spends vast sums aimed at converting Hindus. In his view, this is the main reason why Christains in India engage in social welfare and educational initiatives. These are not offered in a spirit of unconditional service but in order to gain converts, which he says even devalues the work of Mother Teresa. Missionary work, he says, is not that noble after all . Mother Teresa, as a loyal daughter of the Catholic Church, believed that people should be free to convert but saw this as the work of the Holy Spirit, not as a human response. Her order's services are offered in love for people, with no strings attached or expectation of any particular response. Rather, they express unconditional love of the poor, despite Shourie's claim that conversion is the real objective. 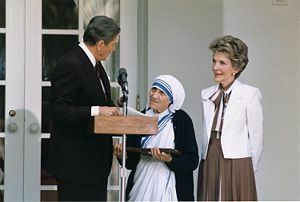 President Ronald Reagan presents Mother Teresa with the Medal of Freedom at a White House ceremony, 1985. In 1962, Mother Teresa received the Magsaysay Award for Peace and International Understanding. In 1971, Paul VI awarded her the first Pope John XXIII Peace Prize. Other awards bestowed upon her included a Kennedy Prize (1971), the Balzan prize (1978) for humanity, peace and brotherhood among peoples, the Albert Schweitzer International Prize (1975), the United States Presidential Medal of Freedom (1985) and the Congressional Gold Medal (1994), honorary citizenship of the United States, November 16, 1996 (one of only two people to have this honor during their lifetime), and honorary degrees from a number of universities. In 1972, Mother Teresa was awarded the Nehru Prize for her promotion of international peace and understanding. Teresa was also awarded the Templeton Prize in 1973, in 1979, India's highest civilian award, the Bharat Ratna, in 1980. She was awarded the Legion d'Honneur from Jean-Claude Duvalier in 1981. She was the first and only person to be featured on an Indian postage stamp while still alive. In 1979, Mother Teresa was awarded the Nobel Peace Prize, "for work undertaken in the struggle to overcome poverty and distress, which also constitute a threat to peace." She refused the conventional ceremonial banquet given to laureates, and asked that the $6,000 cost of the banquet be diverted to the poor in Calcutta. The money permitted her to feed hundreds of needy for a year. She stated that earthly rewards were important only if they helped her help the world’s needy. When Mother Teresa received the prize, she was asked, "What can we do to promote world peace?" Her answer was simple: "Go home and love your family." A memorial room (museum) was opened in the Feudal Tower in Skopje, a building where she used to play as a child. The museum has a significant selection of objects from Mother Theresa’s life in Skopje and relics from her later life. In the Memorial room there is a model of her family home, made by the artist Vojo Georgievski. Next to the Memorial room, there is an area with the image of Mother Teresa a memorial park and a fountain. 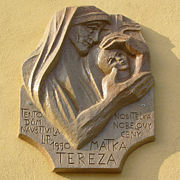 Memorial plaque dedicated to Mother Teresa at a building in Václavské náměstí square in Olomouc, Czech Republic. Mother Teresa Day (Dita e Nënë Terezës) on October 19 is a public holiday in Albania. ↑ | ADDRESS OF JOHN PAUL II TO THE PILGRIMS WHO HAD COME TO ROME FOR THE BEATIFICATION OF MOTHER TERESA October 20, 2003. Retrieved September 23, 2016. ↑ Archbishop: Mother Teresa underwent exorcism. CNN, September 7, 2001. Retrieved September 23, 2016. ↑ Mick Brown, Did Mother Teresa really perform miracles? The Telegraph, September 2, 2016. ↑ David Orr, Medicine cured 'miracle' woman - not Mother Teresa, say doctors The Telegraph, October 5, 2003. ↑ Stephanie Kirchgaessner, Mother Teresa to become saint after Pope recognises 'miracle' The Guardian, December 18, 2015. Retrieved September 23, 2016. ↑ 6.0 6.1 Elisabetta Povoledo, Mother Teresa Is Made a Saint by Pope Francis The New York Times, September 3, 2016. Retrieved September 23, 2016. ↑ 7.0 7.1 Mother Teresa declared saint by Pope Francis at Vatican ceremony BBC News, September 4, 2016. Retrieved September 23, 2016. ↑ Don Lattin, LIVING SAINT: Mother Teresa's fast track to canonization The San Francisco Chronicle, October 12, 2003. Retrieved September 23, 2016. ↑ Ram Sita Goel, "Defining Religion: Ram Sita Goel answers the questions raised in the Antaios' Appeal number on Hindutva," New Delhi, Observer, February 22, 1997. ↑ Arun Shourie, Missionaries in India: Continuities, Changes, Dilemmas (New Delhi: ASA Publications, 1994). Extracts also available online Retrieved September 23 2016. Chatterjee, Aroup Mother Teresa. The Final Verdict New Delhi: Meteor Books India, 2003. ISBN 8188248002 introduction and first three chapters on fourteen (without pictures). Retrieved September 23, 2016. Walter Wüllenweber, "Nehmen ist seliger denn geben. Mutter Teresa — wo sind ihre Millionen?" Stern (illustrated German weekly), September 10, 1998. IDENTIFYING THE REAL SAINT The Princess in a Mercedes or the bare-foot Nun?